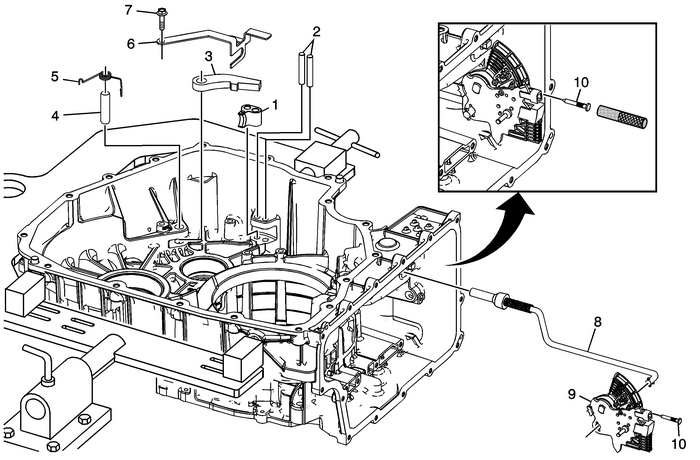 Note:Install the park pawl actuator assembly onto the detent lever assembly. Rotate the assembly clockwise so the actuator rod will fit through the case opening.Lubricate shaft with ATF to prevent damage to the manual shift shaft seal. Caution:Use J-41229 to install the manual shaft pin at thecorrect height in order to properly secure the manual shaft. If youinstall the pin too deep, the case bore may crack. ProcedureUse a NEW pin to ensure proper engagement to the case.Inspect pin installed height is within 6.5–7.5-mm (0.25–0.30-in).